2. Poll Options - The answers or choices to the Poll Question. There are two by default, but you can add as many as you like. Note the "remove" button. 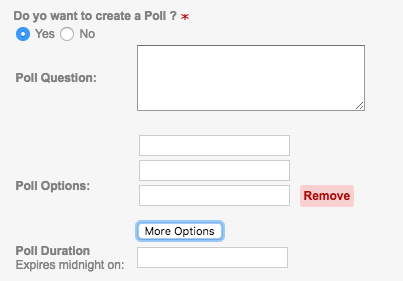 Polls by default allow for two options. If you add more options but then change your mind, you can revert your way back to just two options. Once submitted, answers to the questions will display as percentages with reports of how many users answered being displayed next to those percentages.